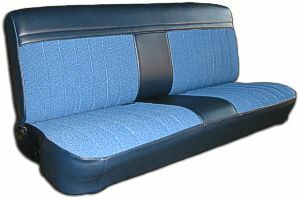 Catalina Custom Upholstery has provided customers with truck seating solutions for many years. These solutions for truck seating has been request from full blown custom show trucks and Saturday night custom cruisers to customers and dealers needing practical work truck upholstery with foam, springs and frame repairs. Materials used in truck seating are of the highest quality available. 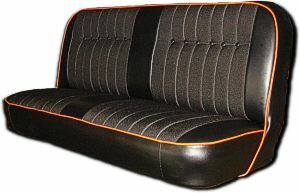 Different types of materials are used in different places on the seat for the benefits these materials provide - example: This black seat has accented orange welting that matched the color of the truck with a black vinyl trim for durability when getting in and out of the vehicle. A durable black tweed cloth was used for the "inserts" (the sitting section) to attain the comfort of sitting on a cloth when the customer is settled into the seat. Leather: Leather is available from high quality American hides with a vinyl matching program. The advantage to a leather / vinyl matching program is considering the expense of leather. A nice leather can be used in the inserts to sit on with a less expensive matching vinyl to "trim" the seat out - this means using a matching vinyl in the parts of the seats that will not be in contact with a person when settled into the seat; the sides, back, ect. Polyurethane: Polyurethane is a new type of solid face material that is a viable alternative to leather while not as expensive as leather. Featuring a very soft hand, cooler than leather to sit on and good durability, Catalina Custom has very satisfied customers that is experiencing the outstanding qualities of Polyurethane to sit on in their truck seats. Vinyl: Vinyl is a good type of material for truck seat upholstery - especially work trucks. Featuring durability, cleanability and comfort, Catalina Custom uses only the finest quality of vinyl's that offer the best of the mentioned characteristics - especially a nice soft hand that is achieved with the new Mellohide backing and many choices in colors to achieve a uniqueness in design and or matching existing interior colors. Cloth: When a truck seat is not exposed to harsh elements, cloth should be considered in the sitting section of the truck seat. Offering many color selections, patterns and textures, cloth is a very comfortable material to sit against when settled into the seat. Also, tweed cloth and velours offer very good durability. Clear Plastic: Clear plastic is a clear vinyl material that is used to protect and preserve an original factory seat cover (usually a cloth seat) from a harsh working environment. The clear plastic is tailored fit to the existing seat to fit over the original cover. The original seat cover color is seen through the clear cover to color correspond with the rest of the interior cab. When a truck is traded in for a newer truck, the clear plastic cover is cut off and the original cover is like new underneath. Catalina Custom Upholstery works with customers to meet the requirements of whatever the project demands - color selection, style, materials, repairs, ect. More examples of truck seating upholstery may be viewed in the Truck section of the Showcase Gallery.